Restaurant, bar, locker rooms, fuel and heliport service. Two 20-tonne overhead crane for towing and launching in minutes. A covered facility of more than 5000 m2 for storage and a workshop specialized in providing assistance, maintenance and technical services completes the offer, giving you peace of mind and the support you need. The strategic location allows quick connection to the most important Italian art cities, through national motorways and railways: Venice, Verona, Mantua, Brescia and Milan. 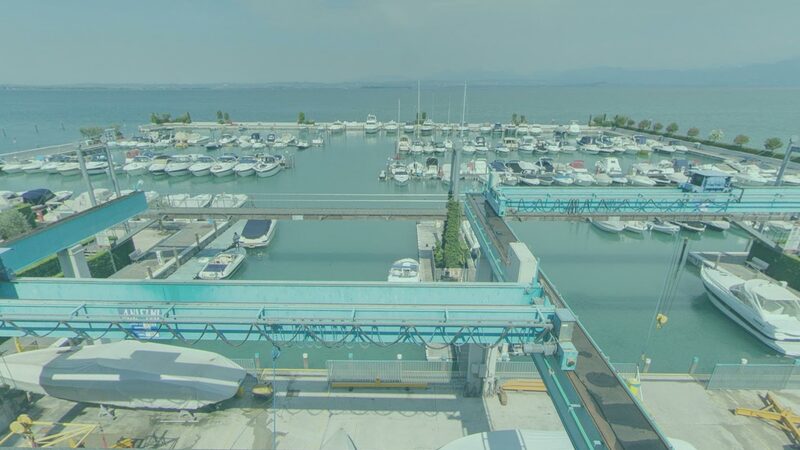 The public lakeside liner service connects with Sirmione, Maderno, Malcesine and Riva, making this Marina a true holiday resort on Lake Garda, just a short walk away from everything you need to relax and enjoy your stay. Peschiera del Garda (VR) highway exit. Head towards downtown Peschiera. Travel along the river Mincio (on your left) all the way to the roundabout. At the roundabout, follow the signs for ALL DIRECTIONS/GARDALAND/ CANEVAWORLD. After the roundabout, stay on the road for about 500 meters up to the intersection, then turn left (heading uphill) in the direction of GARDA – LAZISE. Stay straight for about 3.5 km, until you reach Pacengo. After the traffic light in PACENGO, stay on the road for 1 km, then turn left to reach the Porto NAUTICA CASAROLA entrance. Take the Affi exit. Follow the signs for Lake Garda – Lazise Centro. At the Lazise roundabout, head towards Peschiera del Garda. After 3.5 km, turn right to reach the Porto NAUTICA CASAROLA entrance.